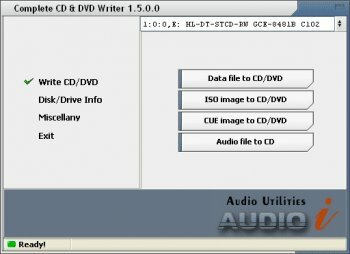 Complete CD & DVD Writer, also called CD/DVD burner, is a software to write audio, data and image files to CD and DVD. One word: burnatonce. It's **FREE**. What's with this 5-day trial stuff? And a beta program with such a hefty price fee. Seems like highway robbery to me. Try Chetah (longer trial, less expensive, and a good program) or Deep CD Burner (free, creates autorun, and works great). Let's give these amateur takers a little competition. I did not download this program, nor will I. But because of the above issues, I will award it one star.